Can’t find the question or answer you’re looking for? Call us on +44 (0)207 1939 748 or get in touch via our contact form. Can I buy/run individual webinars, or do I need to sign up to a subscription? Our customers can buy as few or many webinars as they need. The ability to buy one-off webinars is somewhat of a rarity these days, but 24/7 Webcasting has consciously made the decision to continue offering individual one-off webinars. We’ve even created a whitepaper on the topic – download it here: No Subscription. 5 Opportunities To Run One-Off Webinars. Together with the one-off webinars, you also get our world-class “Full Service” webinar management, which means we setup the webinar for you. Running webinars doesn’t get much easier than that. 24/7 Webcasting offer a high-quality webinar platform with the highest range of features, functionality and analytics. As such, our prices are higher than the market’s low-cost options. However, the additional insight, branding and features offer modern marketers the ability to show ROI more easily and quickly. Our self-service subscriptions offer the most cost-effective price per webinar, while our full-service webinars offer more manual support and services as standard. Prices vary depending on volume. To find out more, call +44 (0)207 1939748 or get in touch via our contact form. Do we get a dedicated account manager? Yes. In fact, you will deal directly with a director-level webinar expert. That doesn’t mean the service you buy is more expensive, it just means we take our approach to customer service very seriously and don’t let cost get in the way of that. After all, a happy customer is a long-term customer. We prefer to do the maths (and business) that way. You can, of course, also buy an ongoing “self-service” webinar subscription from 24/7 Webcasting. These offer more control and a better price point per webinar. Can we get a demo of your webinar platform? Of course. We love showing off the platform, because we know you will love it. 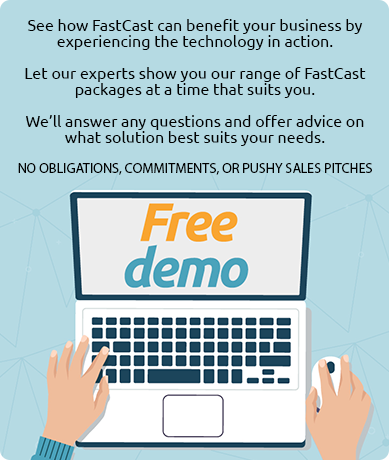 Get in touch and we’ll arrange an online demo of the webinar platform at a time that suits you best. Request your webinar demo here. Can we run a free trial of the webinar platform? Yes. We offer 14-day free trials of the webinar platform. You don’t need a credit card or any payment information to activate it, and it comes with al features activated. Run as many webinars as you want during the 14-day trial period. We do limit the number of attendees to 50 for the trial period, but we feel that it sufficient to test the platform. Can you run my webinars for me? If you want us to, we can and will. If you prefer to run your own webinars, that’s fine too. We usually differentiate between full-service and self-service webinars. In “Full-Service” we do the setup and creation for you (you only provide the content, graphics and speakers), while in “Self-Service” you have access to our intuitive and easy-to-use 7-step setup wizard. Full service webinars can be purchased individually or in larger numbers, while the self-service solution comes with a minimum number of webinars as part of a subscription. However, we do understand that not everything (and everyone) is as black and white as that. So, for a small additional fee, we offer additional full-service support for self-service webinars. Because, there’s always going to be an extra important webinar, or a day when you’re short-staffed. Is there anyone available to support me during my live webinar? Yes. We can provide full service webinars, which allows webinar organisers to focus on the content, promotion and delivery, while our specialist support ensures your webinar is setup and runs smoothly from a technical perspective. Alternatively, if you use 24/7 Webcasting’s self-service solution, you can purchase additional bolt-on services for ad-hoc support. How quickly is real human help available when we need it? We’re called 24/7 Webcasting for a reason. We are available for planned webinar activity 24 hours a day, 7 days a week. Non-critical support is available during standard geographical office hours and we typically measure our support turnaround in hours and days, instead of days and weeks. All support is UK-based. We are available 24/7 for any planned webinar activity. If you need specialist ad-hoc out-of-hours support, call +44 (0)207 1939748 or get in touch via our contact form. A webinar is an online presentation that combines an audio or video stream with synchronised slides and the ability to ask questions via a graphical user interface running in your browser window. Good webinar platforms allow you to activate a variety of additional functionality in order to better engage your audience and collect user information about them. This functionality is accessible via on-screen options and interactivity elements such as polls, surveys, downloads, and social media. Webinars are self-hosted and provide their own registration forms, allowing organisations to run them independently from third party tools. However, integration with Marketing Automation (MA) and CRM tools is easy and beneficial. The analytical insight from a good webinar platform is highly desirable for any data-driven lead generation or marketing professional. How long does it take to setup a webinar? We’ve turned around last-minute emergency webinars in less than an hour, although we recommend taking your time to be thorough. When you use our intuitive and easy-to-use 7-step setup self-service wizard, you have access to time-saving tools such as design templates. These allow you to customise your own branding, design and layout into a saved template, which can be used every time you setup a new webinar. Our setup interface guides you through the seven setup steps, while providing you with tips and prompts for various steps. Everything is designed to make webinar setup and easy and quick as possible. To get a full view of the setup process, why not ask us for a webinar demo. How long are webinars available to view? How many people can attend my webinar? As standard, 24/7’s full-service webinars offer up to 250 concurrent live users (i.e. users at any one time), while the self-service option offers up to 1,000 concurrent users. These numbers can be extended to meet your requirements for an additional fee. However, in the majority of cases these numbers are sufficient. There is no attendance limit for on-demand webinars. Can I design/customise my own webinar interface? Yes. Our webinar console (i.e. the webinar interface) is fully customisable. In addition to your own design and layout, you can also choose from 30+ in-webinar apps to customise the functionality of your webinar. These do not require any installation, but extend the functionality and interactivity of your webinars, increasing user engagement and reporting insight. We also offer a variety of customisation options for the webinar registration pages. Alternatively, you can use our “seamless registration” option to connect your webinars to a landing/registration page created on your own marketing automation tool. Our webinars also come with reminder and follow-up emails for webinar registrants and attendees. These can be fully customised as HTML or text emails. Do your webinars work on mobiles/tablets? Yes. When you run your webinars with 24/7 Webcasting, your audience can view the live stream via the browser on their mobile devices. While a wifi connection is recommended, it is not a requirement provided a good data connection is available. In addition to the webinar stream, users can also access additional webinar functionality, such as Q&A, polls, slides, surveys etc. iOS and Android mobile devices are supported. What level of user data / insight do I get from 24/7 webinar reporting? 24/7 Webcasting provides extremely detailed reporting and insight, which remains unmatched in the industry. By offering users a wide range of in-webinar applications and functionality, webinar organisers have access to any interaction with these features. As a result, our webinars offer a layer of demographic information, which is gathered from the webinar registration form, as well as a layer of behavioural data, which originates from the user’s interactivity with the webinar and its features. All data is combined into a real-time reporting dashboard, which is accessible at any time online. Webinar data is available per user and per webinar, as well as offering the ability to compare webinars to your own account averages and industry sector averages (anonymised). Webinar user data is also available pre-webinar, as well as providing you with visibility of in-webinar (live) and post-webinar (on-demand) data. We’ll be happy to provide you with a demo of all the reporting features, including the custom report feature. Just get in touch and request a webinar demo. Can I connect webinars to my CRM and/or Marketing Automation tools? Yes. The ability to connect our webinar platform with the most commonly used marketing automation and CRM tools is key to our success. Creating closed loop data flow, insight and reporting allows marketers to make better use of their webinars and create better leads and output. We work with you to map and connect the different systems with each other, which can be done using our connection service. Alternatively, we can provide you with a raw XML feed. For more information on this topic or to check whether your marketing automation and CRM tools are supported, please get in touch. Call +44 (0)207 1939748 or get in touch via our contact form. We’d like to use our own landing pages to capture registrants, can we do that? Yes. 24/7 Webcasting’s “seamless registration” option allows webinar organisers to connect a registration/landing page, which was built on your own marketing automation tool, to your webinar. This way, you can use your own forms and landing page, while passing over the information seamlessly to 24/7 Webcasting’s webinar platform. Can we run video in webinars? Video webcast: Your webinar runs a full video stream for the duration of the webinar, showing the speaker(s) or event. This video stream runs in the dedicated media player. Video clips: As part of your presentation, you can show short video clips. These will play within the slide area of your webinar. Video files: Video files can be made available for download within the resources section of each webinar. These are typically not part of the presentation, but are available as supporting information. How can attendees interact with us during the webinar? Webinar attendees submit their questions and comments via the Q&A section, which is a text entry field. These questions/comments are submitted directly to the presenters and organisers, who have an inbox and folders to manage new and answered questions, as well as having the ability to allocate or grade questions according to their nature or importance. During the live webinar, questions can be answered as part of a live Q&A at the end of the webinar. Alternatively, written answers can be sent directly back to the person who asked the question, or organisers can opt to send the question (anonymised) and respective answer to all attendees. During the on-demand phase of the webinar, questions can still be submitted and organisers can define an email address to have them forwarded to in real-time. Questions can then be answered by email. By keeping all interactivity in a written format, the webinar platform is able to include any questions and their answers in the reporting for the webinar, or for individual user activity. Other ways for attendees to interact with the speakers/organisers is via polls, surveys, “contact us” request, or social media. Users can access their social media accounts (Twitter, Linkedin and Facebook) directly from within the webinar, without the need to leave the webinar interface. Can I download the webinar after it’s finished? Yes, you can download webinars as video files. Although we recommend doing this only for future reference, i.e. an offline version/record of webinars that are no longer hosted. As soon as you download a webinar, for example to upload it to YouTube/Vimeo etc, you lose the reporting and tracking ability. Along with that ability, you then also lose your lead generation capabilities. How can we avoid a time lag between the audio and video stream, and/or the slides? When you run webinars with 24/7 Webcasting, you will not have any issues with delays or lags between audio, video or slides, because all of these are combined into a single stream. Unlike some other platforms, which have separate transmissions, 24/7 Webcasting ensures the highest quality and synchronisation. How can you ensure a good webinar stream quality? It is important to ensure good audio/video quality without overpowering the majority of end users’ connectivity. By default, our audio webinars stream at 28kbps and our video webcasts stream at 300kbps, each of which provides good-quality streams. In addition, our webinars benefit from the use of three Content Delivery Networks (CDNs) at any given time. CDNs ensure that a stream originating from, say, North America is made available to attendees in Europe or APAC from local servers. This avoids the need to create global connections and transmissions via the public internet, which can cause delays, packet loss and other issues to cause loss of quality. A CDN is, in effect, a private internet that ensures high-quality and reliable transmissions. By using three CDNs at any given time, 24/7 Webcasting is able to create redundancy, as well as a better geographical coverage. All in all, we have a choice of six CDNs, which can be allocated depending on geographical requirements. 24/7 Webcasting also benefits from two dedicated data centres to provide further redundancy, as well as providing control over the hardware used to host and stream your webinars. For internal communications webinars, which typically create more challenges on internal network capacities, we offer a variety of options to reduce the network impact. To find out more, call +44 (0)207 1939748 or get in touch via our contact form. Can I pre-record my webinars? Yes. 24/7 Webcasting offers a variety of webinar formats that allow you to pre-record your webinars. Which option best suits your requirements depends on your goals. The simplest form of pre-recorded webinars is an on-demand webinar, which is pre-recorded and then made available for anyone to attend. However, interactivity is limited as there is no live element. By comparison, a “Simu-live” webinar allows you to pre-record your presentation, but the webinar can be scheduled for a time in the future. At the defined time, the webinar stream begins and for the audience it appears as if the webinar content is live. This format allows for more interactivity options, including Q&A. We have dedicated a guide to this topic. Access “The Ultimate Guide To Picking The Right Webinar Format” now. Which hardware do I need to record a webinar? Audio webinars are very simple to record. All you need is a phone and phone line (avoid cordless or mobile phones), as well as a computer. Presenters and moderators connect by phone to a conference bridge, from which the audio is fed into your webinar. Video webinars require a more complex setup with cameras and other video equipment. In addition to the equipment you should also make use of a video producer or production team that is familiar with the specific webinar requirements. To find out more, call +44 (0)207 1939748 or get in touch via our contact form. How many speakers can I have on my webinar? Technically there is no limit to the number of speakers you can feature on a webinar. However, each webinar format has a recommended number of speakers that works best with the format and audience. As a rule of thumb, audio webinars should have less speakers than video webinars, as it is easier to differentiate between speakers on video. We have created a full guide on this topic, including the recommended number of speakers per webinar format. Access “The Ultimate Guide To Picking The Right Webinar Format” now. Can I run full video webcasts, and do you provide video equipment? 24/7 Webcasting provides the ability to run high-quality video webinars. If you would like 24/7 Webcasting to run the video production for you, we will provide the full video production team, including equipment. All video production specialists have been fully vetted and trained on our platform. Do attendees dial in by phone? No. Phone dial-in is the domain of meeting tools where all attendees have an equal requirement to contribute. For webinars, which follow a “one to many” format – much like an on-stage presentation – attendees listen to the webinar via the audio/video stream. This way organisers reduce disturbance or interference from dial-in and drop-off tones, as well as background noise from individual attendees. There is one exception, which is used when organisers wish to offer the ability to connect to the audio stream by phone. This still doesn’t provide a two-way line, but it allows attendees to listen in via their phone connection instead of an online stream. Use cases for this scenario include streaming to audiences without access to computers or internet connections. What’s the difference between the 24/7 webinar platform and other tools like Webex or GoToWebinar? 24/7 Webcasting offers the most versatile, customisable and high-performance webinar platform on the market. It is important to differentiate between meeting tools and webinar tools. Meeting tools can be identified based on their need for users to connect by phone. These tools were not designed to run webinars, as phone connections cause more issues than benefits for webinar presentations. Other tools, such as low-end webinar tools, may require users to download and install software or apps, which is not user friendly and often is a sign of limited capabilities and features. Low-end webinar tools also have limited customisation and reporting options, which have a negative impact on your ability to present your content (and company) in the best possible way, or to gain the insight needed for effective lead generation. If you are unsure how advanced webinar platforms, such as 24’7 Webcasting, compare to other tools, please contact us for a webinar demo. I want to have a conversation with all my attendees – like a meeting. Can I do that? No. 24/7 Webcasting provides a webinar solution, which is designed to facilitate a “One to Many” scenario, much like an on-stage presentation. Our solution provides a one-way stream with multiple non-verbal ways for attendees to interact with the speakers, but it is not suitable for collaborative meetings. , because a productive conversation becomes difficult when more than 5 people join the meeting. However, many companies use our webinar solution for internal communications purposes. In these instances, organisers benefit from the structure webinars provide by not having any disruption from call joining/leaving tones or background noise from attendee’s phone lines. How do I avoid background noise from attendees’ phone lines? Attendees joining a webinar run on 24/7 Webcasting’s platform do not connect via a phone line. Instead, they listen to and view the webinar via their browser and headphones/speakers. There is no voice connection from the attendees to the webinar, which means no noise, sounds or other disruptions can be caused by the attendees. Is there a sound when attendees join and leave the webinar? No. Unlike meeting tools, 24/7 Webcasting’s webinar tool provides attendee access via the browser. Attendees don’t connect via a phone line and therefore there are no sounds when attendees join or leave the webinar. However, webinar organisers can track webinar attendance via the reporting tool, which shows attendance duration and time. Can I run a Q&A session during my webinar? Yes. In fact, Q&A is the most commonly used webinar feature with 82% of webinars using this option. Can I run polls during my webinar? Yes. Polls are a very effective and engaging way to gather additional feedback and insight from your attendees. It can help gauge levels of your audience’s interest or knowledge, which can help you qualify leads, or it may help guide your webinar’s presentation. Setting up polls is very easy on 24/7 Webcasting webinars. You can setup multiple polls per webinar and the results are gathered in real-time, and can be shared with the audience instantly. Any poll results are captured in the webinar analytics and can be transferred to your marketing automation and CRM tools, provided you have created an integration between the systems. Can I use my webinar to run training sessions? Yes. 24/7 Webcasting provides a specialist set of tools specifically designed to run training or CPD/CPE webinars. The webinar itself is a perfect vehicle to present, standardise and transfer knowledge, while additional in-webinar functionality enables trainers to run tests, as well as determine trainees’ attendance. For more details and a demo of these capabilities, please get in touch. Can I secure my webinar with a password? Yes. While most marketers will want to ensure maximum attendance and not restrict access to their webinar, there are instances when password protection is crucial. 24/7 Webcasting offers a variety of security settings, including password protection. Can I run a secure webinar only for our employees? Yes. 24/7 Webcasting offers a variety of security options to ensure only your employees are able to access your webinars. This includes limiting access to the organisation’s domain, as well as network origination. We also include options for employees who work remotely and are not usually on the corporate network. I’ve not found the question/answer I’m looking for – where can I get more info? We’d love to hear your questions. Nothing is too simple or too complex. Please get in touch with us by calling +44 (0) 207 1939 748 or submit your contact request here.